Last year I did a great job of planning my family’s meals each week. While we didn’t always follow the plan completely, having one helped me stick to our grocery budget and cut down on our eating out habit. Fast forward to this year and I basically stopped menu planning toward the end of January. I have been spending so much of my time and effort on blogging (and all of the behind the scenes work that goes along with it) that I have been neglecting not only my menu plans, but my weekly grocery budget. Needless to say, we have been doing a great job of supporting our local restaurants. I find all of this ironic and a tad bit frustrating considering that the main purpose of my writing this blog is to help you save money, while sticking to a grocery budget. 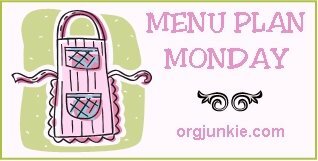 If you are like me and need a refresher course in Menu Planning, check out this post that I wrote back in January. I just reread it myself and am ready to jump into this again.